On Tuesday, Slate published the article “You Live in Alabama. 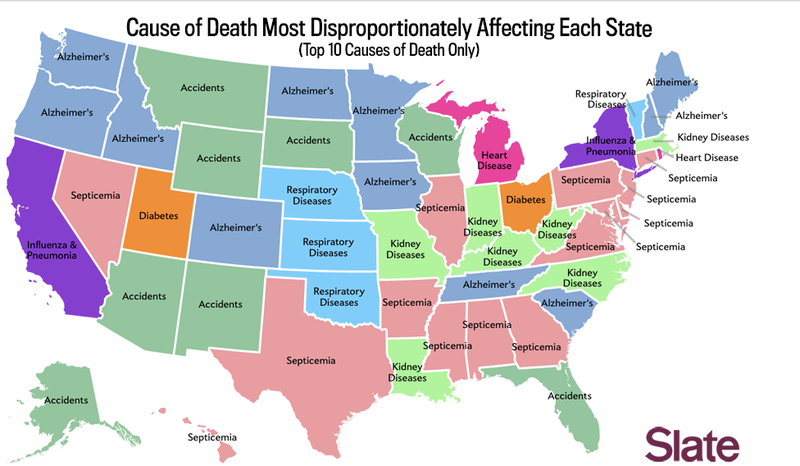 Here’s How You’re Going to Die.” that contained some interesting maps. I liked this one the best. Florida and accidents is the least surprising thing I have ever seen. While this is an interesting map, doing things like this at the state level is not the best. I know it’s probably the simplest way to do things and there are lots of data separated by state, but these maps at the county level would be much more interesting imho. Posted on June 6, 2014, in Uncategorized. Bookmark the permalink. Leave a comment.